If you do not already have a BITCOIN wallet, first create an account on the Blockchain site or on the CoinBase site. Once you have created an account, then create your own public BITCOIN address. You will collect BITCOIN at that address. Also, from this site you can transfer BITCOIN to any other BITCOIN address. If you do not already have micro wallets for BITCOIN, then first create accounts on sites: CoinPot , FaucetSystem , FaucetHub . These micro wallets will be used to collect current payments for the sites for the profit (faucet), and then from the micro wallet from these few sites, transfer BITCOIN to your wallet on CoinBase. Now that you have your own BITCOIN wallet, you can start making BITCOIN. Below is a list of sites for profit (faucet). 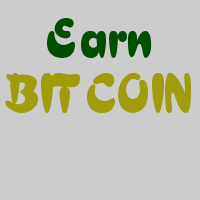 You earn SATOSHI on them (the smallest unit of BITCOIN). The sites are grouped by payment method. Some sites are currently being paid through a micro wallet, and some of them need to collect SATOSHI on the site itself, and then transfer to your BITCOIN address.